Dr. Salman Qureshi received his MD from the University of Alberta and completed postgraduate training leading to certification in infectious diseases, respirology, and critical care medicine from the Royal College of Physicians and Surgeons of Canada. Subsequently, he completed research fellowships in the molecular genetics of susceptibility to gram-negative bacterial sepsis and innate immunity before joining the attending staff at the McGill University Health Centre. 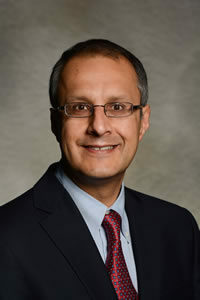 Dr. Qureshi is currently Associate Professor of Medicine, Member of the McGill Division of Experimental Medicine, Research Director at the Meakins-Christie laboratories, and Medical Director of Respiratory Therapy. He coordinates the respiratory medicine curriculum for first year medical and dental students at McGill and is active in clinical teaching of residents and fellows in critical care, as well as teaching and supervision of graduate students and postdoctoral fellows at the MUHC Research Institute. His current research interests include host genetic susceptibility and innate immune responses to fungal pneumonia and bacterial sepsis. His laboratory uses experimental models to investigate the pathogenesis of infectious diseases seen in the critically ill and is funded by the Canadian Institutes of Health Research. He is local site investigator/co-investigator for the Bacteremia Antibiotic Length Actually Needed for Clinical Effectiveness (BALANCE) Randomized Controlled Clinical Trial and the Critical Care Outcomes of Patients with Hematologic Malignancy and Hematopoietic Cell Transplantation (COHO) study.